Jose Reyes has become the first player to be suspended under new Major League Baseball rules brought in to address domestic violence issues. 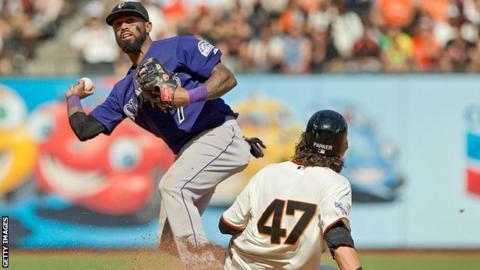 The Colorado Rockies shortstop, a four-time All-Star player who earns $22m (£15.7m) a year, has been placed on paid leave while he faces criminal proceedings. Reyes, 32, who was arrested at a Hawaii resort in October following an argument with his wife, has pleaded not guilty to an abuse charge. His trial is due to start on 4 April. The date coincides with the start of the new MLB season, when the Rockies play at Arizona. The new policy was agreed in August following a number of high-profile domestic violence cases in a number of US sports, including baseball, American football and basketball. Earlier this month, police in Dallas were asked to investigate Cleveland Browns quarterback Johnny Manziel after a complaint by his ex-girlfriend. In 2014, NFL running-back Ray Rice was handed an indefinite ban after a video emerged of him punching his fiancé in the face. The player was released by the Baltimore Ravens and is now a free agent after winning an appeal. In the same year, Jeffery Taylor who played for Charlotte Hornets in the NBA, was suspended for 24 games without pay after pleading guilty to domestic assault. World champion boxer Floyd Mayweather was jailed for three months in 2012 after pleading guilty to attacking his ex-girlfriend.